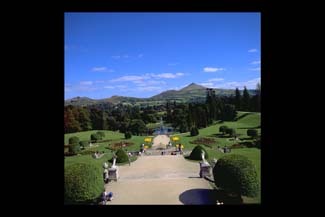 Formal gardens on a grand scale in a magnificent setting. 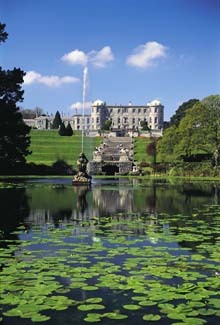 Justly famous for the glory of its setting and the grandeur of its scale, Powerscourt is Ireland’s most visited garden. 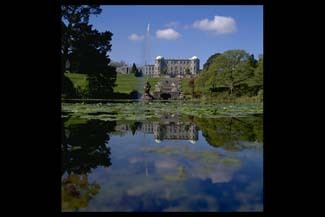 Parts of the plan date back to the 1740s when Richard Cassel, also architect of Leinster House, designed a series of terraces and a circular pool as a suitably imposing foil to the Palladian mansion he had created for Viscount Powerscourt. 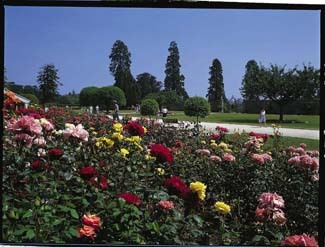 A century later architect Daniel Robertson was commissioned to embellish the garden in the then fashionable Italianate style. The main elements of the design are an elegant stone staircase leading down from a broad terrace and adorned with a statuary walk, culminating in two magnificent pegasii guarding the lake. Featuring pebble mosaics in the shallow steps of the staircase and a Neptune fountain at its foot, the design is thought to be based on the gardens at the Villa Butera in Italy. Further chapters in the garden’s history included the addition of a woodland walk known as Tower Valley, planted with rhododendrons - including some magnificent large leaved varieties, conifers with a pepper pot tower as a focal point, and a ‘Japanesey’ garden. This European version of a Japanese garden is set in a hollow with two Japanese bridges, pools and acers, and has recently been restored and replanted. Beside it is a weeping grotto built from volcanic stone, where ferns and mosses flourish. 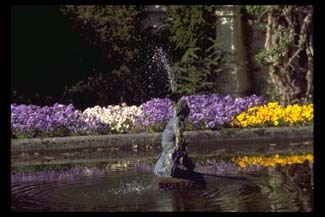 Beyond the lake, paths lead through groves of towering specimen trees and on to the Dolphin pond set in a sylvan glade. A very splendid gate adorned with gilded roses, thistles and shamrocks symbolising England Scotland and Ireland (but no leeks, perhaps for decorative reasons) provides the link back to the formal areas of the garden, via double herbaceous borders. the building now houses a very successful shopping complex and restaurant (lunch on the terrace is recommended). The Greenhouse complex offers decorative homewares and a garden centre - altogether a very satisfying place for a day out. 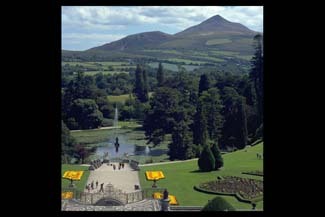 The Powerscourt Waterfall - Ireland’s highest - is also nearby. Near Enniskerry village - well-signed in area.